"It was a pleasure to deal with Paul Wickers he treated me like a guest in his own home." Read our customers' honest and impartial Aston Martin V8 Vantage car reviews and ratings to easily find your next car at Motorparks. Car is exactly as described, maybe even better than described. Grange staff were superb and faultless. The 2017 Vantage S is a fantastic driving car with ample power and precise handling. Above all it is the best looking sports car on the road and the interior is super stylish and a minimalist's dream. A pleasure to drive as a daily commuter or on long runs. I still can't quite believe I am now the proud owner of a V8 Vantage roadster! It is everything I expected it to be and more! Looks stunning, sounds even better, but can still easily cruise down the motorway in relative comfort. But get it on the open road, and it comes alive. Words cannot describe it. Over the years I have owned many prestige sports super cars. I currently own a ferrari 488 which, whilst both beautiful and fast, spends most of its time in my garage not going anywhere for fear of too many miles on the clock, or envy vandalism! 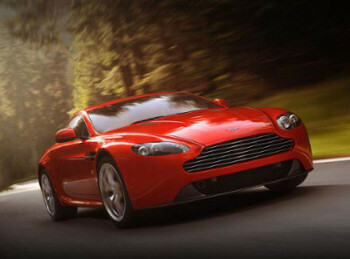 I was offered the chance to drive the new Aston Vantage V8. It didn't take me long to realise what I had been missing after all these years of owning Ferraris. This car offers everything. Looks, never had so many people and friends commenting on how lovely the car looks. Speed and performance.This car is every bit as quick as my Ferrari and it sounds better. I part exchanged a Mercedes AMG E63 which I used for every day driving for the Aston. It fits the bill perfectly. I can get 2 sets of golf clubs in the car including a small compact trolley! This car does everything and for half the price of my 488. The Vantage is a genuine every day usuable car which brings a smile to my face every time I get in it. Thank you Aston.